Wanted to do something to my nails but just wasn’t getting time to try out something that would take a lot of time. And in such conditions one nail art product that can really change the look of your nails is glitter. Recently I got this little pot of glitter from kkcenterhk.com and since I was short on time I thought I’d make use of it. Before I say anything more lets take a look at my finished nail art! 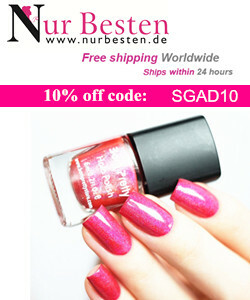 I have used a very fine glitter from N.Nails in pink color. Glitter nail art is very very easy to do. Before you begin create a working surface to catch all the glitter fallout which you can pour back into its original packaging to prevent wastage. Using a large piece of paper is good. Then take some glitter on the lid of the glitter container and pour it over your wet nail (do this nail art one nail at a time so that nail paint is fresh and wet when you pour glitter on it), pour enough glitter to cover the entire nail and don’t worry about extra glitter all over your finger (another option is to dip this nail into the glitter container itself). Now to finish off your gorgeous nails use any good top coat and cover each nail. I used the Orly top & bottom for this.